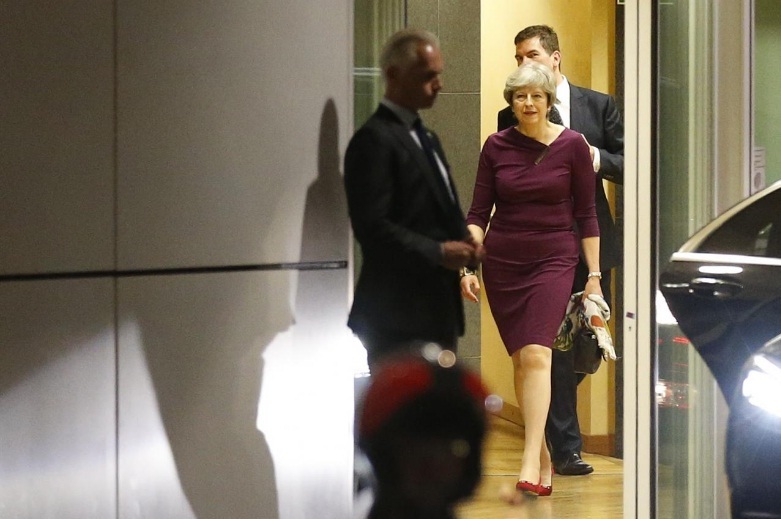 Britain’s Prime Minister Theresa May leaves the European Commission headquarters after a meeting with EU Commission President Jean-Claude Juncker and EU’s chief Brexit negotiator Michel Barnier in Brussels, Belgium October 16, 2017. LUXEMBOURG/LONDON - European Union ministers told Britain on Tuesday it must make more concessions in talks over its departure from the bloc, offering little sign of a breakthrough for Prime Minister Theresa May at a summit later this week. May traveled to Brussels on Monday for dinner with senior EU officials, hoping to nudge the Brexit talks forward to look at future ties which she says will help London make advances on calculating a financial settlement. But hours after the dinner, ministers from EU countries, even those such as the Netherlands that have the most to lose if there is no Brexit deal, said May needed to go further on detailing how much Britain will pay when it leaves the bloc. After losing her governing Conservatives’ majority at a June election and struggling through the party’s annual conference, May has little room for maneuver -- unable to increase her offer on the Brexit bill for fear of angering her own party. “We, the 27 together, find it extremely important that substantial progress is made on all three areas,” Dutch Foreign Minister Bert Koenders told reporters. But he also said the EU would offer May an olive branch at their summit on Friday by saying they would start preparing among themselves for talks on a post-Brexit transition in order to be able to engage with Britain swiftly after London delivers. “I hope that in the UK the reality comes in that this is a possibility to come to the next stage in December,” Koenders said in Luxembourg where ministers were preparing for the summit this Thursday and Friday. After the Brussels dinner on Monday, May and European Commission chief Jean-Claude Juncker said the pace of Brexit negotiations should be stepped up after they stalled largely over the size of the divorce bill. But neither side signaled there would be much movement at the EU summit after five rounds of talks, and some EU ministers in Luxembourg on Tuesday said it was hard to negotiate with a prime minister under pressure from Brexit hardliners. With only 17 months before Britain leaves, the lack of progress in the talks have prompted companies to get ready not only for London leaving without a deal but also for a prolonged lack of certainty which makes investment decisions difficult. At the summit in Brussels on Thursday and Friday, May is due to set out Britain’s Brexit position and then leave the room as the other EU leaders discuss the progress of the talks to unravel more than 40 years of union. According to a draft of the conclusions for the summit, the EU are unlikely to agree with May that it is time to move the talks forward, but will instead suggest starting a discussions on transition among themselves. Foreign minister Boris Johnson told the British parliament on Tuesday he hoped “our friends and partners” in the EU would discuss the transition period, saying “if we’re going to get on to that kind of question, now is the time for them to do so”. British officials have increasingly accepted that Friday will not bring the breakthrough they had hoped for, but believe an improved tone may mean that might not be too far off. “The PM is pleased with how the dinner went, it was productive, it was a friendly discussion,” a spokesman for May said. But members of her party have reduced May’s room for maneuver, with some Brexit campaigners saying if there was no progress on Friday, the prime minister should walk away. “It’s all about the money and if she ups the bid now, that is a really hard sell politically,” a senior source in May’s governing Conservative Party told Reuters. European Union ministers told Britain on Tuesday it must make more concessions in talks over its departure from the bloc, offering little sign of a breakthrough for Prime Minister Theresa May at a summit later this week.